I'm always pleasantly surprised when guest contributor Kimie puts fabric to sewing machine. As a talented quilt maker, she has started expanding her skills into creative pieces like the one that she's sharing with us today. And keeping a steady stream of creativity coming through her Pinterest page, I have no doubt that she will continue to share projects for every season, holiday and celebration! 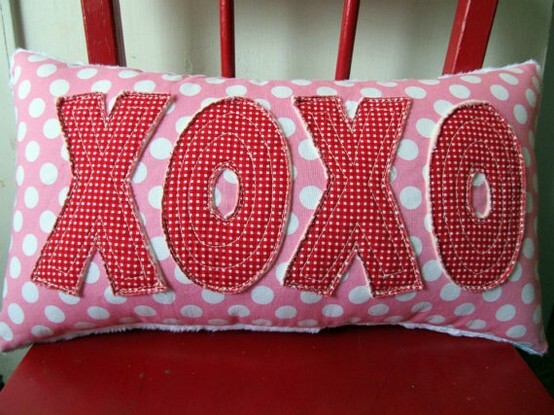 After seeing this Etsy Valentine's pillow on Pinterest, I raided my leftover fabrics to find something to make a similar pillow. Success! 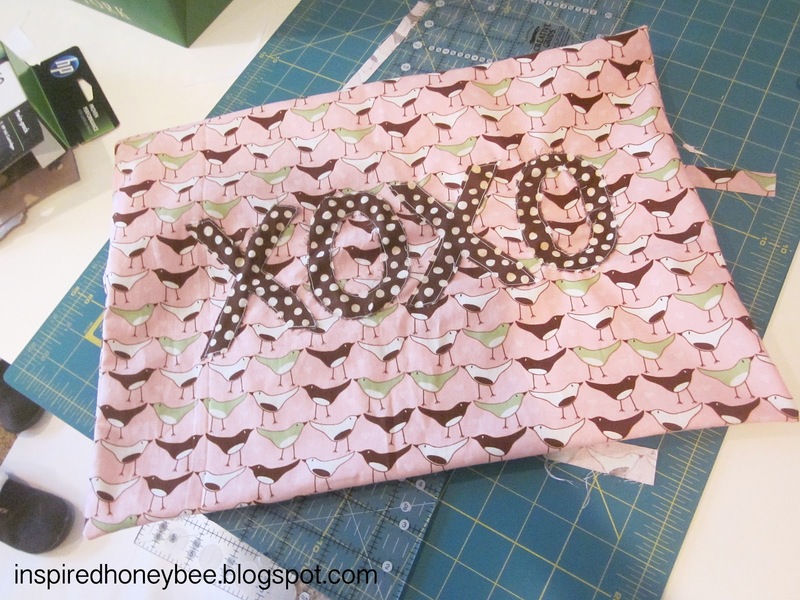 I decided to try to do an envelope pillow for the first time, and was amazed at how easy it is. 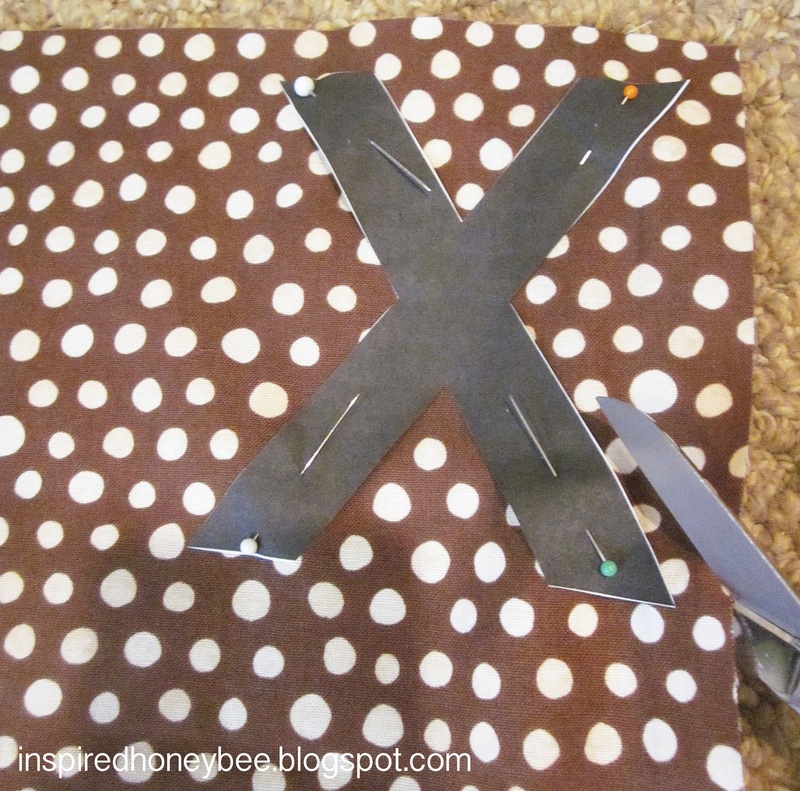 First, find the dimensions of the pillow insert by cutting three pieces of fabric. The first piece (or front) needs to be 2 more inches in length and width than the insert. For example: my pillow was 13"x13", so my front piece of fabric was cut to 15"x15". The back two pieces can be the same height (15"), but the length can be shorter. I cut two pieces of fabric that were 15"x7". 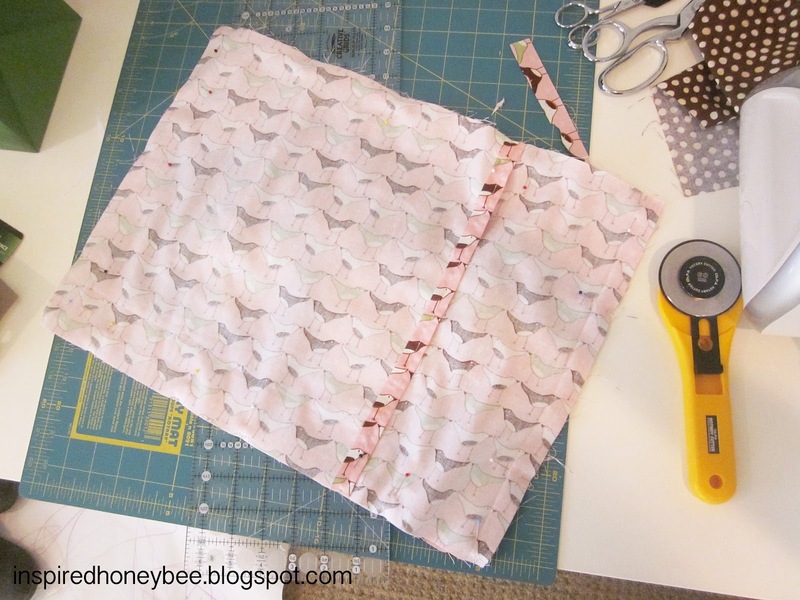 Lay the front and back pieces on top of each other to make sure that the sizes are similar before you begin pinning. Make adjustments as needed. Iron a seam on both back pieces of fabric. Only one of the seams needs to be sewn since the other one will not be seen. Before sewing the three pieces together, I cut and sewed the letters on the larger front piece of fabric. I found a font on Microsoft, printed the letters to size, cut them out and pinned the X's and O's onto my fabric. Make sure to align the cut letters on the front piece of fabric, then pin the letters to secure in place. 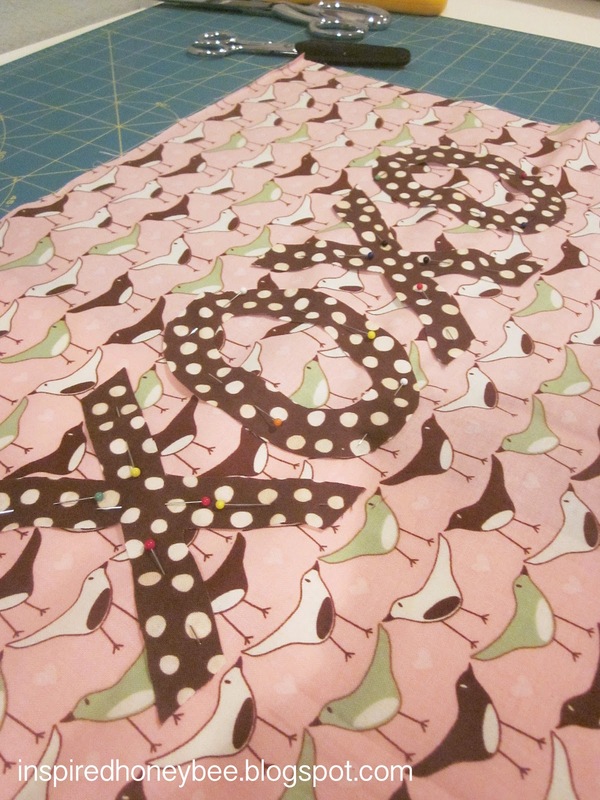 With the letters in place and the three pieces prepared, lay the front piece of fabric down with right side facing up. Then lay both smaller pieces down with right sides facing down. 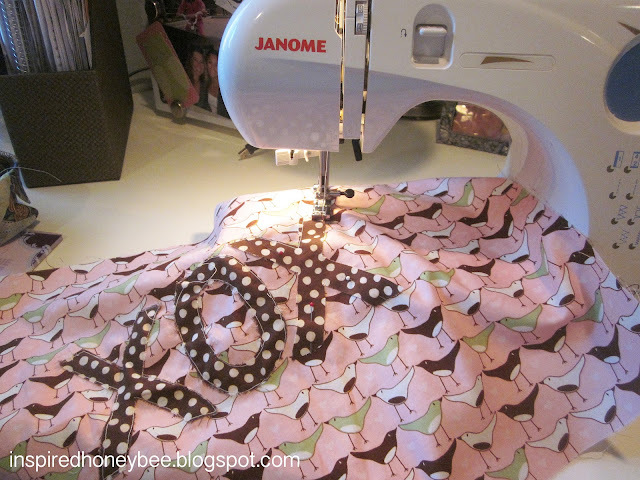 Pin along all four sides of the pillow and sew. No need to leave any opening, since your insert will slip through the envelope opening. Turn pillow right side out and stuff! Visit momtastic.com if you need additional step-by-step instructions. Happy Valentine's Day! 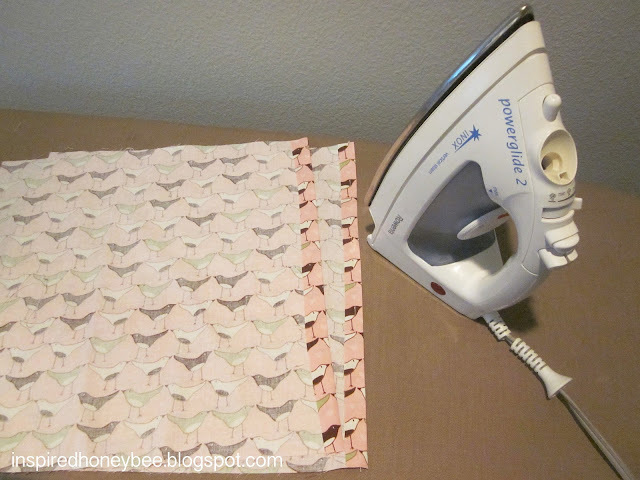 Oh cuteness, I love your fabric choice, the birds are so pretty. 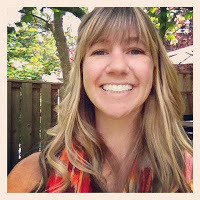 By the way I was stopping by to let you know I've nominated you for the blog Leibster award. Check it out whenever you get a chance! Oh I love this pillow. Too darn cute. Thanks for sharing at I Gotta That. 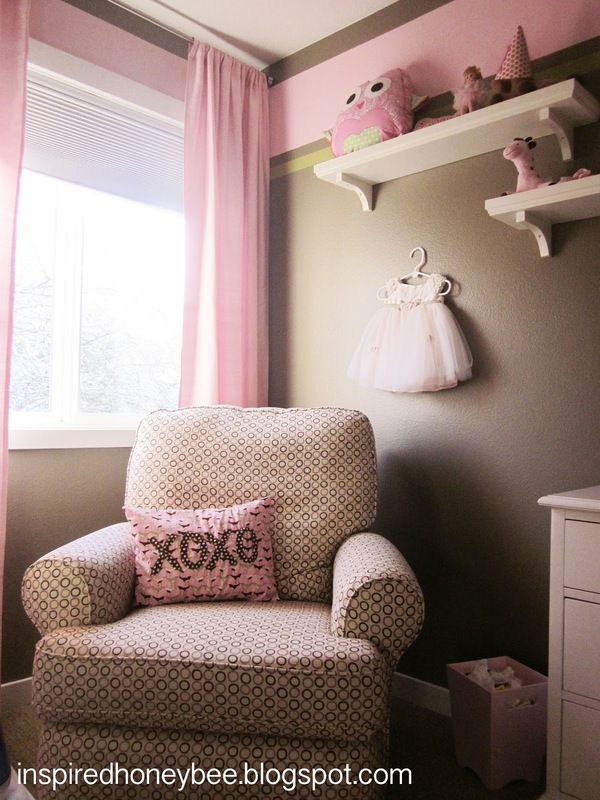 I love this pillow, the fabrics are lovely. Thank you so much for linking up with Whip It Up Wednesday! Have a wonderful week, and I hope you'll share more projects in the future.